Facebook is the most widely used social media platform with 1.45 billion active daily users; the platform is an amazing opportunity for you to find a ton of potential leads who you can convert into customers. But you can’t just post some photos on your Facebook business page and expect to receive an explosion in traffic and sales. There are a ton of ads on Facebook and a lot of users ignore them, so how do you stand out from the crowd and convince users to pay attention to you? The answer is to create a Facebook marketing campaign, and there are some can’t-miss strategies that will help you reach the success you’re looking for. Let’s take a look at how to create a Facebook marketing campaign that boosts ROI. The first step to creating a successful marketing campaign for Facebook is to determine your campaign goals. You can’t just go in blindly without any real idea of what you want to accomplish. So choose an objective and build your campaign around it. 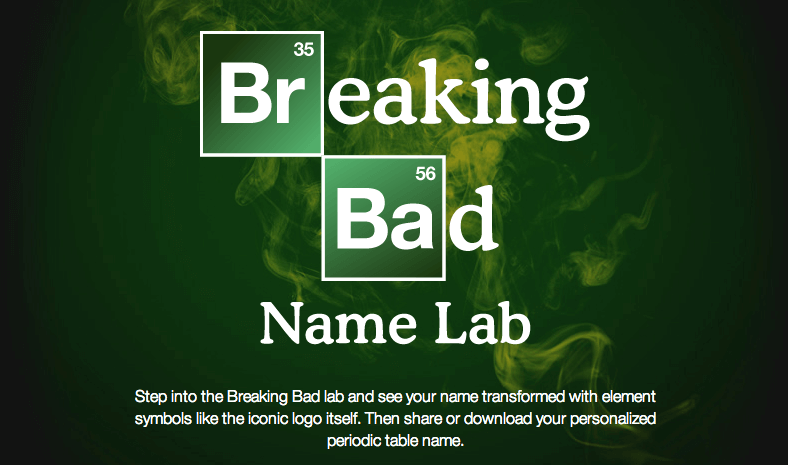 During their final season, the TV show Breaking Bad created a successful campaign with the goal of increasing engagement by releasing a fun app that allowed users to create a graphic of their own name in the style of the show’s logo. Breaking Bad Facebook Engagement Campaign. Setting your goals will help keep your campaign focused, and you’ll see more results because of it. You have to know your audience and what they’re looking for if you want to convert them. It would be a waste of time and money to advertise to people completely outside your demographics, but you don’t want to exclude anyone either and miss out on a potential sale. 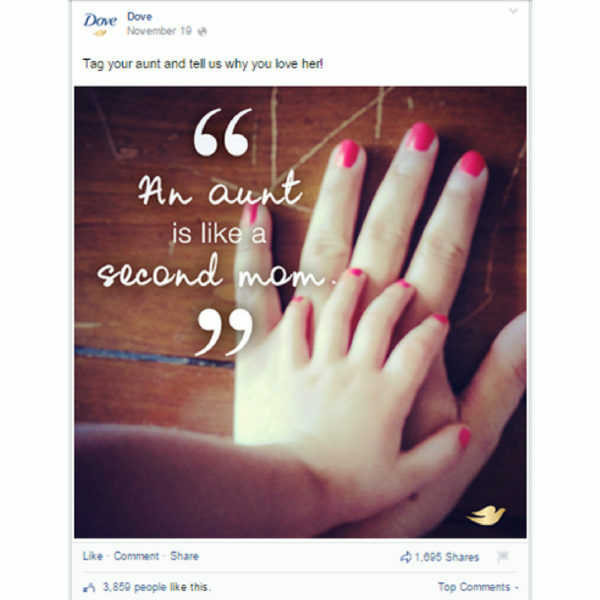 In this Facebook campaign from Dove, it’s clear they’re reaching out to aunts and nieces. Figure out in detail who you want to target. The more details you know about who you want as a customer, the easier it will be to place your ad right in front of them. Inspire, tell stories or encourage laughter. Whether you’re posting a touching video that will make people cry, an inspiring quote, a photo that makes users laugh, or running a contest that stirs up creativity–craft posts that make people feel something. 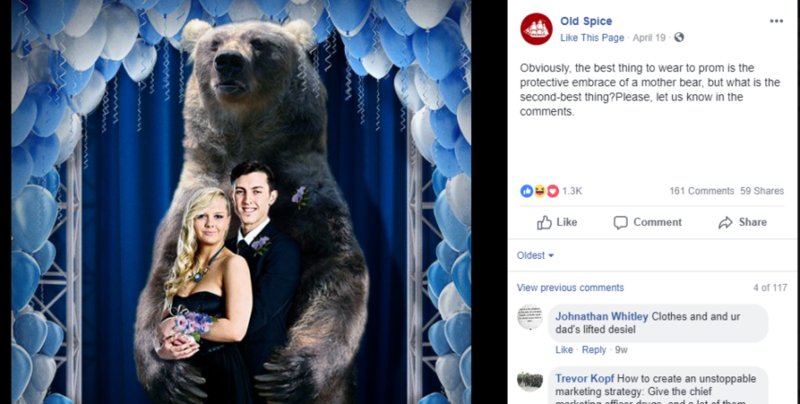 Old Spice is a brand known for their crazy sense of humor, and their funny posts get a ton of engagement on social media. No one is going to take a second glance at your campaign if all you’re doing is telling people to buy your product. People aren’t interested in commercials or ads, so by telling a story and stirring up emotions in users, you’ll receive way more engagement, and people will be more willing to give you their attention. Use striking images and keep the text short. Consider what will stand out in a crowded feed. According to Buffer, photos posts get 39 percent more interaction than other posts on Facebook. So creating posts with eye-catching photos are bound to get your campaign noticed. Moo.com used this colorful and bold image to make their business cards stand out. 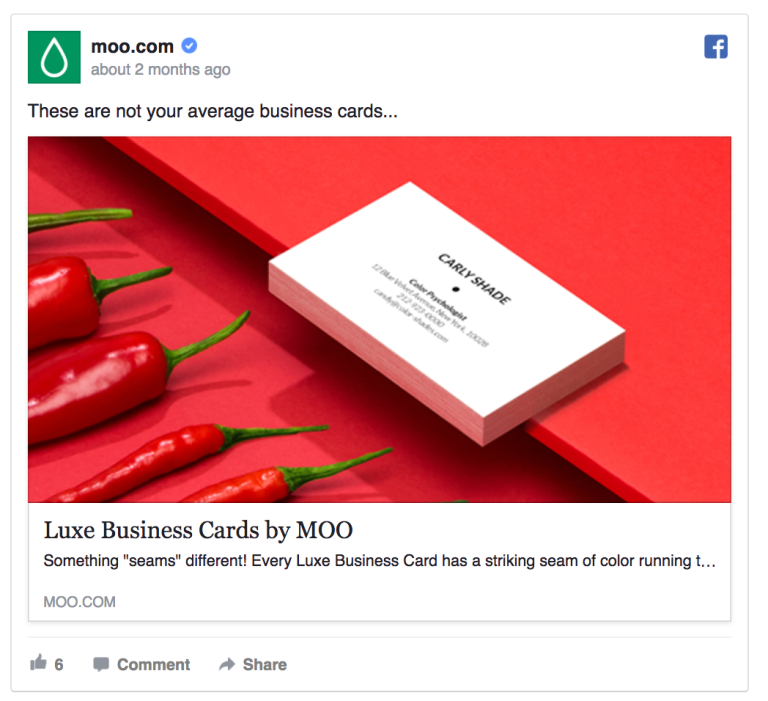 Facebook Ad for Moo Business Cards. Another tip is to keep the wording on your ads concise, short and snappy and posts should also include a clear call-to-action. Make it obvious to people what you want them to do, for example, tell them to visit your website to enter a contest and include the link for them to click. A Facebook ad campaign will allow you to widen your reach and introduce your company to a whole new audience, but you never know if those people will be interested in what you have to say. That’s why Facebook retargeting is a super effective tool to add to your campaign; it allows you to target people who you already know are interested in your business. 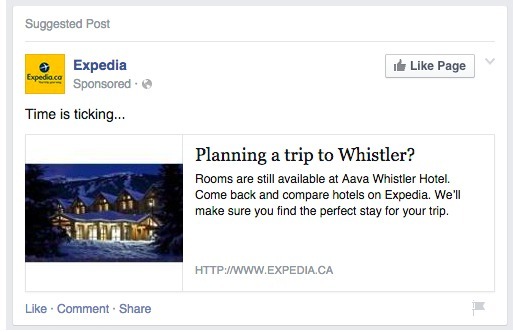 Expedia uses retargeting ads to entice visitors who were browsing trips to Whistler on their site and encouraged them to return. Facebook Retargeting Ad from Expedia. Retargeting is great because it allows you to track visitors to your website. If a user visits your website and leaves without taking your desired action, you can ‘follow’ them to Facebook and show them an ad that encourages them to return to your site and buy or subscribe. Facebook is a great place for small businesses to get the most out of their marketing efforts. You can boost your sales on Facebook without spending a dime by creating an engaging campaign for your followers, and you can see even greater results from spending just a bit of money for an ad campaign that will reach plenty of new leads. As long as you have a plan in place for your campaign, your company will reap the benefits. Biz Tips: Can Guilt Be Useful To Get People To Buy Something?